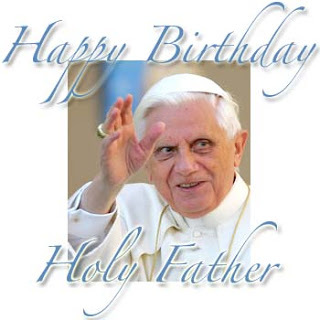 Today is April 16, 2013 and it is the 86th birthday of His Holiness Pope Benedict XVI, Bishop of Rome Emeritus. I want to offer my congratulations and prayers to the Holy Father on his special day. 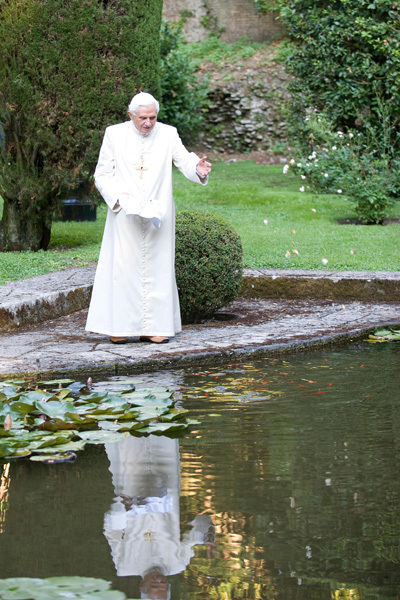 It has been nearly two months since Pope Benedict XVI retired. Pope Emeritus is an awesome man. He is an intellectual and I am a fan of his books. One can tell from his writings that he is indeed a professor. He has a gift of presenting his thoughts, Church teachings and research so eloquently. He does not water anything down and I love that. Catholic Church who have been causing much scandal. He has restored dignity to the rich Liturgies of the Roman Rite which has been toyed with since Vatican II by progressives hoping to create some "kumbaya" atmosphere in our prayer. Pope Benedict XVI's resignation shows that he was never in it for the power, fame, or papal perks. Despite receiving criticism for restoring the regal presence of the Papacy, he did the right thing in reminding us all about the Primacy of Peter. In my opinion, while praying at a monastery he is more powerful there than going about in a "Popemobile." I hope Pope Emeritus will continue writing books. Reading his books, you can tell he knows a lot, not only about theology.